The 2019 Vancouver Sun Harry Jerome International Track Classic will be held at Swangard Stadium in Burnaby, BC on Thursday evening, June 20th, 2019. This year marks the 36th edition of the renowned international athletics competition that honours Harry Jerome. 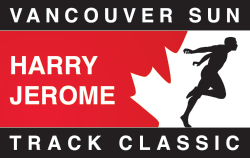 Since 1983, The Vancouver Sun Harry Jerome International Track Classic has provided an opportunity for top Canadians to compete against athletes from around the world. This one day competition is an important step in meeting critical Olympic and World Championships qualifying standards. The 2019 World Championships are set for Doha, Qatar from September 28th to October 6th in preparation to the 2020 Tokyo Olympic Games.